One month ago, Alistair Overeem (Pictured) revealed he had joined the talented team at Xtreme Couture in Las Vegas, Nevada to prepare for his UFC 141 top contender bout against Brock Lesnar. Unfortunately for the former Strikeforce heavyweight champion, circumstances have forced him to leave the gym and return home to the Netherlands. 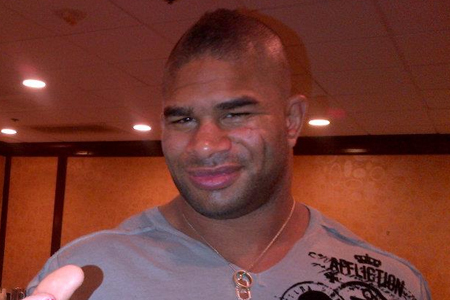 “I am now training for Lesnar in Holland,” Overeem shared in his blog for Yahoo! Sports. “I flew back about a week ago. I don’t want to go too deep into personal matters, but what happened was my mother is recovering from cancer and needs my support. While having to break camp and start anew so close to showtime would significantly disturb some fighters, the veteran of 47 mixed martial arts bouts believes the move will actually allow him to prepare full bore for his impending brawl with Brock. Despite the unexpected turn his training camp has experienced, Overeem’s confidence in his ability to perform when the curtain is drawn on December 30th hasn’t wavered one bit. In fact, he stands by the bold statement he made last month when the two sat just inches away from each other. UFC 141 takes place inside the MGM Grand Garden Arena in Las Vegas. The heavyweight shootout will headline the pay-per-view broadcast.